The Jantar Mantar is a collection of architectural astronomical instruments, built by Maharaja (King) Jai Singh II at his then new capital of Jaipur between 1727 and 1734. It is modeled after the one that he had built for him at the Mughal capital of Delhi. He had constructed a total of five such facilities at different locations, including the ones at Delhi and Jaipur. The Jaipur observatory is the largest and best preserved of these. It has been inscribed on the World Heritage List as "an expression of the astronomical skills and cosmological concepts of the court of a scholarly prince at the end of the Mughal period". However, Jaipur has a number of sights that should not be missed. The famous Palace of the Winds of course. And this Observatory, the Jantar Mantar. The photo shown on this page is the only one I have left. I can only remember that we stayed here for a short while, maybe half an hour, wondering what this stone objects really meant. Truly miraculous janta mantar in jaipur I visited in November 2014. It still shows the correct time the sun dial and yes my little knowledge of astrology also helped me to understand the planetary positions depicted in jantar mantar. I visited this WHS in January 2012. 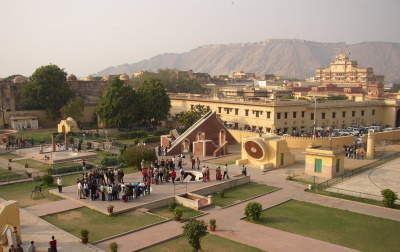 This astronomical observation site in Jaipur includes several astronomical instruments of the Mughal period. Quite interesting to visit in the middle of the Pink City. My last visit to the Jantar Mantar at Jaipur was as long ago as 1992 so the accompanying photo has had to be scanned in from a 35mm slide!! But I remember the visit, and indeed the entire stay in Jaipur with pleasure. This is a worthy addition to the list and a visit to Jaipur will bring in many other fine sights too! India’s Tentative list entry for this site originally listed the existing 4 Jantar Mantars for potential inscription (Jaipur, Delhi, Varanasi and Ujjain – a fifth at Mathura no longer exists) but must have concluded that it was better to concentrate on that at Jaipur. They were all built by Jai Singh, “a regional king under the Mogul Empire”, between 1724-7. Jaipur’s is the largest and, as I remember the one in Delhi many years ago, the better preserved/restored – though the small one in Varanasi situated atop a building is also rather fine and I have never been to Ujjain. They all provide a haven of quiet from the bustling city outside within a walled “park” containing a series (Jaipur has 14) of large (the biggest at Jaipur is 27m tall) and complicated-looking astronomic instruments, known as “Yantras” , each designed to measure some aspect of the passage of heavenly bodies – determining time, predicting eclipses, placing planets etc. 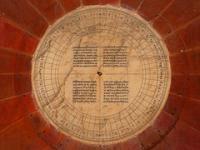 My photo is of the “Jai Prakash” – a hemispherical sundial said to be Jai Singh’s “most elaborate and complex instrument”. I would not claim, either at the time of the visit or now, to understand how the various instruments worked - if you want a run down have a look at http://www.jantarmantar.org/Architecture_Science_web.pdf . We didn’t take guide in those “far off” days but I could imagine that doing so or having a good written description of how each instrument worked could add to the visit experience.